Homily delivered by Fr Eddie O’Connor SMA on the occasion of the Provincial celebration for the 70th Anniversary of Fr Liam O’Callaghan’s Ordination as an SMA priest. It was delivered during the Mass celebrated in the SMA Oratory, Blackrock Road, Cork. Today, with our brother SMAs all over the world, we celebrate the founding of our Society. In the Irish Province we have another reason for celebration in that we rejoice with Liam O’ Callaghan on the 70th anniversary of his ordination. Last year we celebrated Tom Fitzgerald’s 70 years of commitment as an SMA; next year if God wills, we will celebrate with Bob O’ Regan but today is Liam’s day. Liam and his classmates were ordained on 14th December 1941 but, because of the war, he, Eugene Dennehy and Eric White didn’t arrive in Kaduna until 1943. The prefecture of Kaduna, under Msgr. Hughes, took in 5 provinces and covered an area of 120,000 sq. miles. The main mission stations of Kano, Zaria, Kaduna and Minna catered almost entirely for a population of Southern Catholics while Argungu in Sokoto Province, Gawu and Masuga in Niger Province, were opened with hopes of evangelising the rural people. In Liam’s first tour he worked in 5 parishes, including Masuga and Argungu, and spent most of his second tour in Masuga. Our picture shows a young Fr O’Callaghan in the normal clerical garb of the 1940’s in Nigeria. Niger Province in the 40s tested many a man’s faith since there was so little progress. The statistics for Rome of 1939-40 showed Gawu and Masuga as having a total of 27 Catholics – not a statistic that would appeal to a new missionary full of zeal. Many a time Liam and those before him and those who followed him must have wondered if the Church would ever take root in an area that was so dominated by Islam. They spent endless days in negotiating with chiefs and local authorities for permission to open schools so that they could have some influence on the young. They were days of frustration and anger and wishful thinking that they weren’t somewhere else where there was some progress. Most of their work had little to do with the Gospel and little fruit to show. Some years ago I asked Liam what a missionary’s life was like in Niger Province in his young days. He said, “Most of the time you just sat there, waiting…” That was the story of Niger and Sokoto Provinces at the time – waiting for the seed to bear fruit, however little. They were missions that demanded an almost impossible faith, the kind of faith where men just hung on praying that God would carry them through each single day as it came. Theirs was the apostolate of presence – hoping that sometime the ground they prepared at such emotional, spiritual and physical cost would bear fruit. And so it happened – though those who suffered the setbacks and the heat of the day often didn’t witness the harvest that has shown itself in the diocese of Minna and the prefecture of Kontagora set up under Tim Carroll. In those far off days Liam’s wildest dreams couldn’t have envisaged what wonders the Lord would work in his own time. His early years seemed to be a sort of merry-go-round of parishes – from bush to township and back again. He was the first resident priest in Kurmin Mazuga in Southern Zaria in 1946 and lived in Zonkwa, Zuru and Minna but the places he is particularly associated with are Kano and Zaria where he spent most of his years. Compared with Masuga and Argungu, these were thriving centres for Church activity; the difference being that you were dealing, for the most part, with Southerners who had been baptised or, at least, were familiar with Catholic beliefs. But these people had to be looked after too and Liam certainly did that. He was always around in his shorts with a bundle of keys hanging from his belt and the ever-present stick of cigarette in his mouth. We know that these centres had their frustrations too and it must have been his calm nature, patience and wry sense of humour that often carried the day when Ibo persistence reared its head. When Liam was in Kano with Tom Duffy in the late 50s he had an early introduction to international living when Victor Chukwulozie joined them. Victor was the first Nigerian priest ordained for Kaduna in 1955 and his piano-playing added a new dimension to community life. On one occasion Victor had to be rescued by Tom and Liam when he decided to preach Christ crucified to the Muslims of the Birni, the old city in Kano. There was nothing quiet about Victor’s presence – Man-Mountain, as he was popularly known! Others were headline-people, prominent at occasions, with strong forceful views, movers and shakers in the local Church and in the Society but not Liam. His presence has always been a quiet one, nothing spectacular, no great projects, a calm exterior, keeping the show on the road yet with definite opinions of his own expressed where they mattered. The men he lived with over the years were a mixed bag of personalities – Tom Duffy, Danny Watson, Gerry Scanlon, Steena Murphy, Billy Byrne, Jimmy Holland, Peter Devine and others. Liam must have had a special gift in community living because he got on with them all, even though his own placid nature was so different from some of the exuberant characters he worked with. I remember Liam in CKC, Sabon Gari, Zari – hospitable, no frills – but you were always welcome. I worked with him and Fr Barry on the first finance committee set up for Kaduna. Liam was the diocesan procurator. He was methodical almost to a fault, straightforward. If your accounts weren’t right Liam wanted to know the reason. He hasn’t changed. 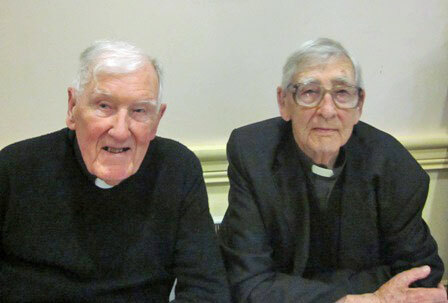 Fr Joe Maguire (left) worked with Fr Liam for 33 years in Nigeria. Liam had health problems over the years and he left Kaduna in 1980. When his health stabilised he took up an appointment in Limerick diocese where he spent 13 happy years before retiring to Wilton in 1993. Of the 1941 class only Liam and John Begley – who left the SMA and married many years ago – are alive. We think today of John who is seriously ill in Dublin and his wife and we remember his classmates, Benny Sands who died in Kwa in Jos prefecture in 1949 and Eric White who died in Kaduna in 1973. Especially do we remember Liam’s family, particularly his brother Denis who died tragically in a drowning accident as a seminarian. Like most SMAs there’s very little spectacular or remarkable about Liam. Just an ordinary man living out the motto of the SMA – Faith, Hope and Charity – as much today as he has done for the last 75 years. A good man, a good member of our Society – who has held fast to his God, his faith in the Church and his missionary commitment all his life. Liam may you be truly blessed and may your days be truly happy.